Known as a JIT supplier of long rails, Vossloh rents out Robel long rail transport units as well as „Rs“, „Rns z“ and „Res“ flat-bed cars from its fleet of vehicles. All the wagons are RIV cars and can be used on European standardgauge railways. They come either equipped with GPS as standard, or else can be equipped with it. We‘ll be happy to advise you on finding a customised transport solution to suit your needs. 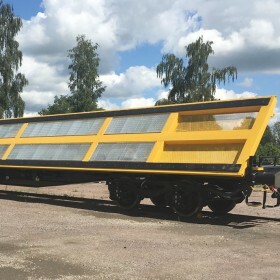 Combined with the STS rail transport system or the standard flat car, the AAW can be used to load and/or unload long rails of up to 180 m in length. 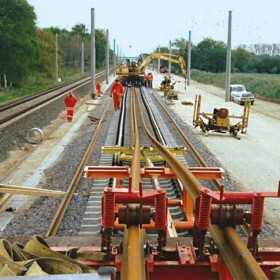 This flexible and cost-effective system unloads long welded rails from STS units or standard flat cars onto the sleeper heads or the middle of the track. 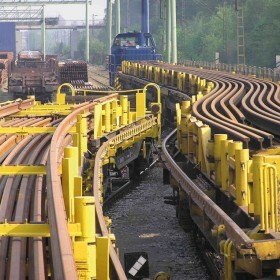 These long rail transport units (LSEs) form part of the Robel system, which comprises LSE and SLW rail loading wagons. 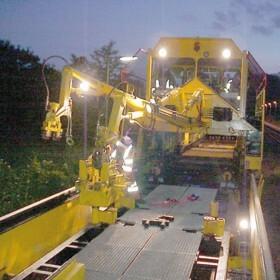 The SLW has a self-propelled crane that travels on rails running the entire length of the Robel transport unit. 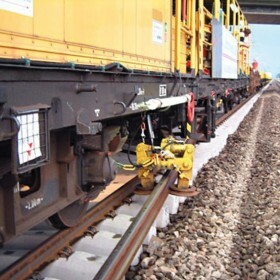 The SLW is the fastest and most economical solution for loading and unloading long rails of up to 360 m in length. 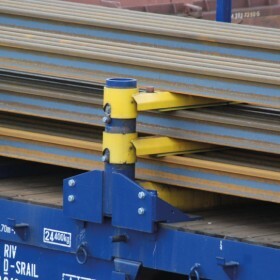 Due to their size, pre-assembled turnout segments cannot usually be transported on standard flat cars. Special transport wagons designed for this purpose with loading beds that tilt enable switches to be transported safely.